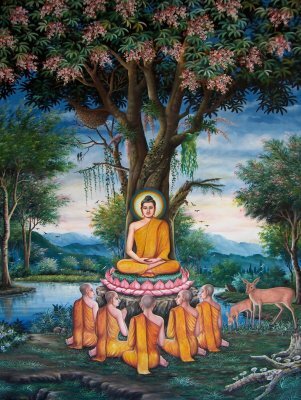 After Siddhārtha Gautama became enlightened he preached his first sermon in a deer park at Sarnath (Mrigadava) near Vārāṇasī (Benares) to five disciples. This painting of the event is at Wat Chedi Liem near Chiang Mai in Thailand. I've used a perspective correction on the image as it wasn't possible to take a picture straight on. It was taken in November 2004 CE. The image is also available under the GFDL on Wikipedia and on Wikipedia Commons and is used to illustrate various pages on Buddhism.